Great South Virginia Beach Resort w/800 foot sandy beach. 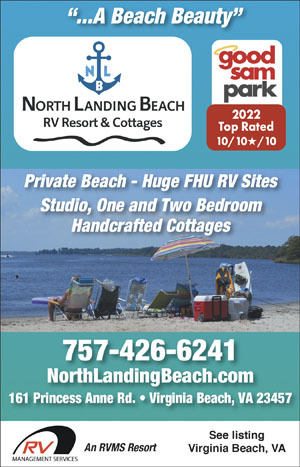 New amenities; 100 HUGE, FHU level RV sites, 90+ Studio/1-bed/2-bed cottages, Pool, spa, fitness center, 30 private bath suites, mini-golf, free WiFi & Cable TV. Warning...long post...hahaha Ok...we made it thru our Halloween event weekend at North Landing Campground outside of Virginia Beach. Before posting this comment I did go back and read it's reviews for the past two years and found that the negative reviews were pretty much on point....as were some of the positive ones. I have to say that in all fairness we are a KOA camping family and tend to compare everything to KOA. We were very excited to change up and try something closer to home that our kids and grandikids would enjoy for the Halloween experiance. We decided on North Landing because beause the online agenda for the weekend was amazing compared to others we looked at. It's prob best to put everything into pro's and con's Pros 1) Pricing was fair on RV sites 2) Late check in was fantatsic and easy.Office closes at 5pm but everything that you need is left for you in a side mounted box so that you can settle in and worry about check in the next day. 3) Smaller campground but sites were fine. We stayed in the 200 section as I like wooded lots but the campgound has very distinct different camping areas. Wooded sites, water front and water view and clear pull thru sites. 4) Bathrooms were fantastic. Family style and clean. 5) Campground is basically on the river so very nice if you are into boating/fishing. Also has nice beach area. 6) Events that the kids were able to do were enjoyable and did make up for allot of the overall dissappointment. Magician was a huge hit with the kids. 7) Campsite trick or treating was nice. Cons 1) Like reviews that I have read...They dollar you to death. Everytime I turned around it seems we are being charged for something. 2) Bounce houses...One of the reasons we came here is because our kids would love the bounce houses and arcade room....Of course...they were closed! And on an event weekend as well. Then we found out there is a daily charge for the kids to enjoy them! 3) Campground web site was down or not working properly and the agenda we had did not match up perfectly with the agenda we received at check in. Friday events turned out to be adults only even though our agenda did not specify that. 4) As other negative reviews stated...There did not seem to be any enforcement of night time quiet. We had to deal with multiple loud parties and profanity late into the evening. It was very difficult to get to sleep because of this and impossible to prevent the kids from hearing it or scaring them. This alone could have ruined our whole visit. 5) Kids did enjoy the scheduled events but they were not planned well. Each event did not have enough items for the kids.....I.E short on pumpkins for pumpkin decorating and short on Halloween bags for the Halloween bag decorating. Please keep in mind none of this was free as you purchased everything. I was fine with that but they did not have enough. 6) No real Campground staff presence. I can honestly say I saw no real presence of campground staff. If they were there working I certainly did not see them or any easy to see staff shirts. 7) Our site was full service but waste connection was to far away. So we had to pay to use the dumping station on the way out. 8) Firewood we though was expensive. $6.00 for three pieces of cut wood.. Oh and $4.00 an ice cream for the kids. 9) One vehicle per site. There is a daily parking charge for an additional vehicle which must be parked at front of campground. 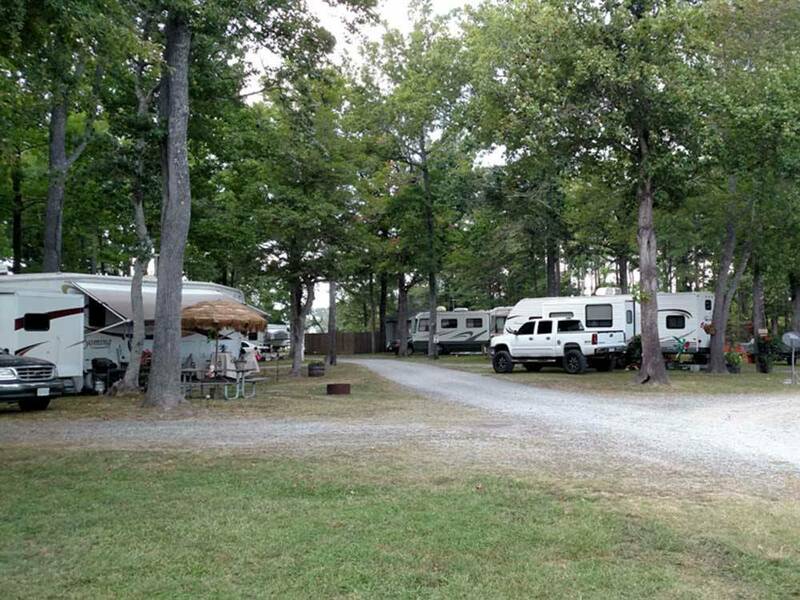 I can see where some people would love this campground and some people like us would be dissappointed.We spoke with other campers who told us that this was not the same experience for them this weekend that hey had early in the 2018 season.We were told that they are normally better with the events and making people feel welcome. There was what seemed to be an overall lack of concern or interest by the campground to make this a place that you WANT to come back to again. Spent a long overcast weekend at this campground. The facility is well maintained, very nice and clean bath houses that appear to be recently remodeled. Staff was great and very friendly, Lots for the kids to do with playgrounds, pool and river access. Was impressed with their online reservation system which provided site details. Quiet campground in general and nice place to relax. So me and my family checked in late and the was help by the night guy to get set up. Thank you.... Got to our spot and guess what no picnic table, no, fire pit, not even landscaped with mulch and solar lights like all the other lots. So, next day 9:00am rolls in and i go to the office to let them know i need a table and fire pit the cashier (a lady) showed no concern about it she just over looked it and said "your balance is 100.14" really is this how its done.......So i brought it back up and she said; "it will be awhile before they get to it" now I'm paying for a deluxe pull thru that suppose to have these things and this lady is unconcerned about my family and our needs. one star for customer service. Above that the camp ground is nice and lots of things for the kids. But treatment of me and my family is number one. It's all good I'll take my cash somewhere else. Excellent RV Park. Beautiful kept. Nice Security Gate. The private beach has a great fishing spot at the end of it. The manager owner presented her self lending a helping hand to make sure we have a pleasant stay. We have everything to make your family RV trip an adventure. Relax by the pool while the kids play in the water fun game area. Launch your boat or unwind on our sandy beach. This is what affordable Family Fun is all about.